On a summer of 2016, at lunch time, the priests recalled the younger years of Fr. Pete. He was tall, handsome, and athletic. He was champion in Archery. He led the Sports and Athletics of the University. During the 80’s, Pete was the heartthrob of this campus. Fray Pete heard the conversation and was grinning. It could be noticed from his skinny face as he munched his soft diet. “Is it true Father? I asked. “Yes, but now I’m the kidney-throb.” The entire refectory collapsed with laughter. “When I was in Bronx, in our parish there, a huge African-American man just got in the office who attempted to threaten everybody. He was from the neighborhood and looks unstoppable. I came closer to him to inquire and to pacify him. When he seemed to be out of control, I hit him on his neck with the back of my palm. He fell. And then we called the police. That was the last resort I could think of.” Fr. Pete narrated to us. Pedro Abapo Escanillas was born in San Jose, Antique. He made his Simple Profession on September 3, 1969 in Monteagudo, Navarra, Spain. He was ordained priest in Marcilla, Navarra, Spain in July 15, 1973. From then he was sent to San Carlos City, his first assignment, and then before the year ends he was sent to Cebu City. The following year, he was assigned in Manila for two years. In 1976, he was transferred to UNO-R Bacolod for three consecutive terms until 1985. From 1985 he was in Bronx, New York, USA until 1995. 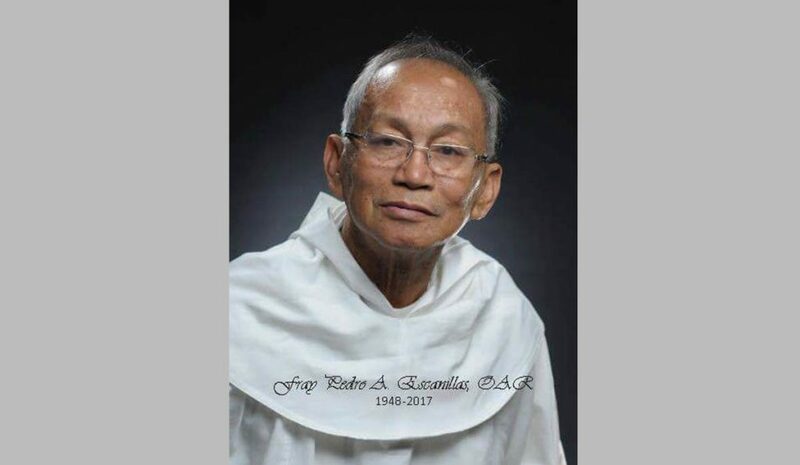 From 1995, he was the Parish Priest of Our Lady of Consolation in Mira-Nila, Quezon City, he stayed there for ten years. It was in 2004 when he moved to San Carlos City, the second time. From San Carlos he was sent to Talisay, Negros, Occidental as Prior during the time which he frequented the hospital battling for heart ailment. In 2012, he was suffering from acute diabetes, had his toe removed. He had mild stroke and recovered. He fell ill again and again and twice a week, his nurse takes him to his dialysis at Riverside Hospital. UNO-R Bacolod is his last Religious assignment as Director of Scholarship. At 3:36 AM today, August 9, 2017 Fr. Pete passed away due to brainstem failure secondary to cerebrovascular accident and multi organ failure at the Riverside Medical Center. He was 69 years old. His interment will be on August 12, after the 8:00 AM funeral mass at UNO-R Oratory. Fr. Pete lived a very “colorful life” as noted by a fellow religious, (at his age, he was still fascinated with fireworks). Colorful life does not necessarily mean ostentations or perhaps claim to power or most likely as others might describe that which whiskey brings color to life. Being able to live the remaining days, of confinement, of simplicity, of mostly in silence for many months and die for it is enough to mean colorful life. God, in His mercy has given him final rest on this Year of Holiness of the Order. He has helped a lot of people. He has touched hearts in his missions. His merits and demerits, we leave it to God. Rest in Peace Father Pete.